Here you will find a short account of the history of chocolate. The term "chocolate" is taken from the Aztec name of the drink, "Cacahuatl" which they made from beans of the Cacoa plant. The native American Indians living in what is now Mexico used chocolate as a staple article of food. It was so important to their civilzation and economy that beans from the cocoa plant were used as currency. 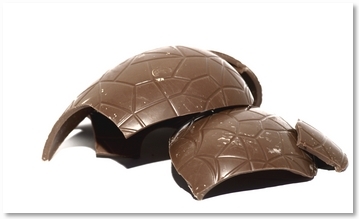 From the Mexican colonies, the use of chocolate quickly spread to Spain and eventually the rest of Europe. In this early period, chocolate referred only to the drink as solid chocolate had not yet been invented. Chocolate quickly became popular in Europe, where it was regarded as a healthy drink. "It is a perfect food, as wholesome as delicious, a beneficient restorer of exhausted power; but its quality must be good and it must be carefully prepared. It is highly nourishing and easily digested, and is fitted to repair wasted strength, preserve health, and prolong life. It agrees with dry temperaments and convalescents; with mothers who nurse their children; with those whose occupations oblige them to undergo severe mental strains; with public speakers, and with all those who give to work a portion of the time needed for sleep. It soothes both stomach and brain, and for this reason, as well as for others, it is the best friend of those engaged in literary pursuits." "Time and experience," he says further, "have shown that chocolate, carefully prepared, is an article of food as wholesome as it is agreeable; that it is nourishing, easy of digestion, and does not possess those qualities injurious to beauty with which coffee has been reproached; that it is excellently adapted to persons who are obliged to a great concentration of intellect; in the toils of the pulpit or the bar, and especially to travellers; that it suits the most feeble stomach; that excellent effects have been produced by it in chronic complaints, and that it is a last resource in affections of the pylorus. Chocolate appears to have been highly valued as a medicine by the leading physicians of that day. Christoph Ludwig Hoffman wrote a treatise entitled, "Potus Chocolate," in which he recommended it in many diseases, and instanced the case of Cardinal Richelieu, who, he stated, was cured of general atrophy by its use. In Renaissance Europe, chocolate came to be known as the "milk of old men" because its use had become so common that it was perceived that chocolate is, with respect to them, what milk is to infants. However some doctors of the time went so far as to say that "In reality, if one examines the nature of chocolate a little, with respect to the constitution of aged persons, it seems as though the one was made on purpose to remedy the defects of the other, and that it is truly the panacea of old age." These improvments led to the creation of the modern chocolate industry and the creation of products that are familiar to use today including chocolate bars. Now chocolate could be packaged and sold by itself rather than as a drink. Chocolate is now no longer regarded as mainly a health food. However it continues to have used beyond making Easter Eggs and filling boxes of chocolate. During World War II (in an era before Meals Ready to Eat) American soldiers were given chocolate as part of their rations, because of the energy boost that it could provide. Chocolate has even gone into outer space as part of the ration packs for Russian cosmonauts. Milk and chocolate chip cookies go together like peanut butter and jam, or Batman and Robin. Find out more about this simple but delicious chocolate treat. Chocolate fountains make an eye catching and delicious center piece at a table. 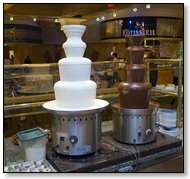 Learn about chocolate fountains and what you need to know in order to make sure that your get together goes well. Rediscover the delicious taste of homemade fudge with these classic recipes. Tasty chocolate brownies. Do we need to say more? 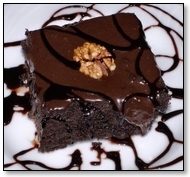 Follow the link to get some yummy brownie recipes. Stop feeling guilty about sneaking that chocolate bar. Chocolate is good for you. Maybe. 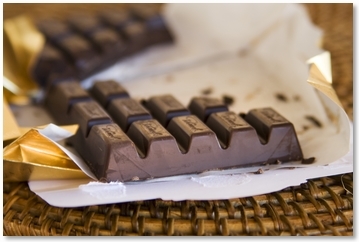 Here is a list of recent studies claiming that chocolate will make you healthier. Though none claim that it will make you skinnier. Sigh! Here is a list of the top ten Hollywood movies with chocolate in their title, or which feature chocolate as a main plot theme. Who knew there were so many? Do you love chocolate? If so you are probably like the 14 out of 10 Americans who say they love chocolate and prefer it to almost anything else. Here is a short quiz to help you decide if you are really a chocolate lover or just a chocolate amateur. Mouth watering old fashioned chocolate recipes for cakes, cookies and desserts made with love.